The Virgin Galactic doubters are eating their words after their soon-to-be low-Earth orbit spaceship made its third successful test flight on Friday. Each test flight has reached higher altitudes, with Friday’s flight making it 71,000 feet above the Mojave Desert. 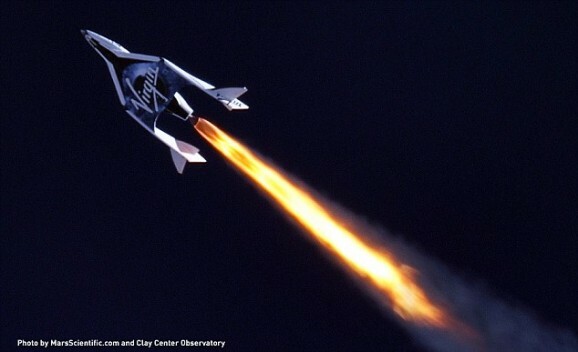 Virgin Galactic’s White Knight Two airplane carried the six-passenger spaceship between its hulls to just over 45,000 feet and then released it, leaving the spaceship to use its impressive rocket motor to keep on soaring. The rocket burn lasted 20 seconds, achieving Mach 1.4. That part of the flight lasted 10 minutes, and the two pilots had landed the plane safely in the desert within an hour. Chief pilot David Mackay said that the craft “flew brilliantly.” Virgin Galactic happily tweeted the news, along with some pretty awesome photos. Richard Branson’s company launched its first successful test flight back in April (video below), when it became the first commercial airliner since the Concord to break the sound barrier. After making 28 glide, or non-powered flights, that first powered flight reached 55,000 feet. That puts Virgin Galactic one step closer to the commercial spaceflights they’ve been advertising and selling tickets for at $250,000 a pop. Branson is confident that the first spaceflight will occur later this year, and he’ll be on board. Six hundred and seventy-five people have already paid the deposit for the flight, prompting Branson to announce that they’ll build four additional spaceships to accommodate the demand for space tourism. In addition to the winner of the upcoming reality show Space Race, a number of celebrities have already reserved their spots on the SpaceShip Two, including Justin Bieber, Katy Perry, Russell Brand (hmm…will they be on the same flight? ), Ashton Kutcher, Stephen Hawking (he nabbed a free ticket), Kate Winslet (she got free tickets too, thanks to her husband’s gig as VG’s head of marketing), Brad and Angie, Leonardo DeCaprio, and Lady Gaga. If you’ve got a quarter million to spare, you can see the stars with the stars.